Advice on China's new Five-Year Plan (2016-20) is being sought by the Cabinet for the first time from top international economists along with their Chinese counterparts. The joint efforts are aimed at ensuring the new development blueprint meets the reality of local conditions, with the help of international experience, so that China can avoid falling into the "middle income trap", Premier Li Keqiang said. "It is the first time the State Council has invited domestic as well as foreign experts to give advice on the making of a five-year plan," the premier said at a seminar during a visit to the National Development and Reform Commission on Monday. The commission is the country's top planning agency. 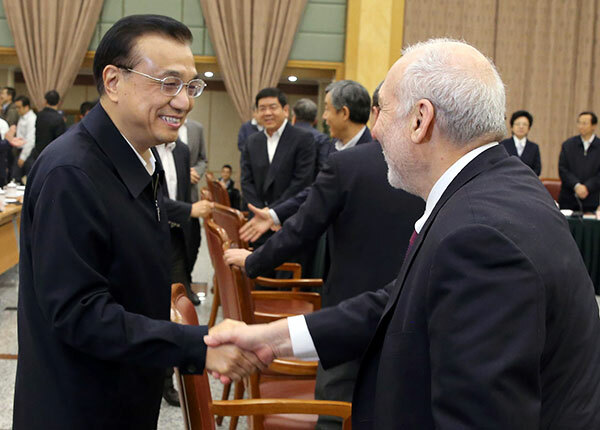 Li said total factor productivity should be included in the 13th Five-Year Plan. Total factor productivity refers to a variable that accounts for effects in total output not caused by traditionally measured inputs of labor and capital. Li said an increase in total factor productivity calls for growth led by human capital, not natural resources. "How do we play up human capital in economic growth? The answer is institutional reform and technology innovation," he said. Nobel Prize economics laureate Joseph Stiglitz said at the seminar that China can continue to increase growth with the right policies. But more important is whether living standards will rise along with growth. "What China needs in the next Five-Year Plan is more publicly provided consumer and investment goods," he said. "The investments that are needed today include local public transportation systems and investments in cities." Jonathan Woetzel, Shanghai office director for McKinsey and Co, the multinational management consulting firm, said, "We believe there is an opportunity to increase productivity, and the 13th Five-Year Plan can and should place new emphasis on quality over quantity of growth." Cai Fang, vice-president of the Chinese Academy of Social Sciences, said at the seminar that total factor productivity is the best gauge to assess innovation-driven growth. Improving productivity hinges on two factors－dismantling institutional barriers and upgrading technology. "In the next five years, the contribution of the workforce to economic growth will continue to diminish. The migration of rural laborers to cities will slow. All of this will contribute to an increase in productivity," Cai said.